When I read that list, I cannot wait to read the book — and I've read it three times already! This is not even one quarter of the book. You can guess from the list that some are technical, others are personal, a few may be controversial. One thing we had fun with was organizing the contents. The chapters are, as you see, in alphabetical order. But each piece has thematic tags. Some were a little hard to classify, I admit, and some people will no doubt wonder why, say, Bill Goodway's The magic of Lamé is labeled 'basics', but there you go. One thing I did with the tags was try to group the chapters according to the tags they had. Each chapter has three tags. 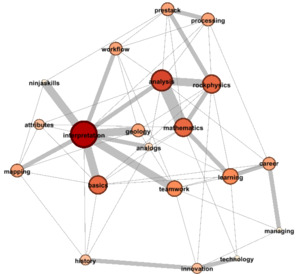 If we connect the three tags belonging to an individual chapter, and do the same for every chapter, then we can count the connections and draw a graph (right). I made this one in Gephi. The layout is automatic: relative positions are calculated by modeling the connections as springs whose stiffness depends on the number of links. Node size is a function of connectedness. Isn't it great that geology is in the middle? I think this accurately reflects the variety in the book. Next post we'll have a look at the variety among the authors — perhaps it explains the breadth of themes.